AAAA Alkaline batteries. Battery equivalent to Quadruple A, Quad A, E96, LR61, 4061, MN2500. Type: Alkaline. Voltage: 1.5 V.
Price: £3.55 each pair. £3.30 each if you buy two or more pairs. Postage and packing included. The AAAA, LR61 or 'Quad A' battery can be quite hard to find. The AAAA or LR61 is nevertheless a popular small cylinder battery is commonly used in graphics tablets and in smaller, portable electronic devices, including Laser Pointers, PDA’s, Two-way Radios, Voice Recorders and may other battery powered applications. 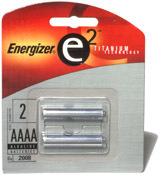 These AAAA or LR61 batteries have a shelf life in excess of four years. Why not buy two or more packs of these AAAAs. Take advantage of our reduced price and make sure you are not left unable to use your device next time your AAAA battery runs out.